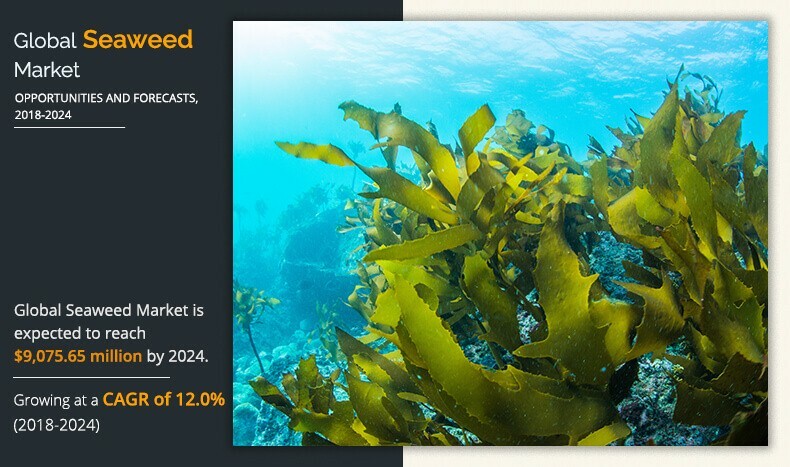 The global seaweed market size was valued at $4,097.93 million in 2017, and is projected to reach $9,075.65 million by 2024, registering a CAGR of 12.0% from 2018 to 2024. Before the advent of large-scale seaweed farming, seaweed was foraged only by the coastal communities. With growing awareness towards health benefits of seaweed and its commercial use in various end-use industries, various countries across the globe have adopted commercial harvesting operations. 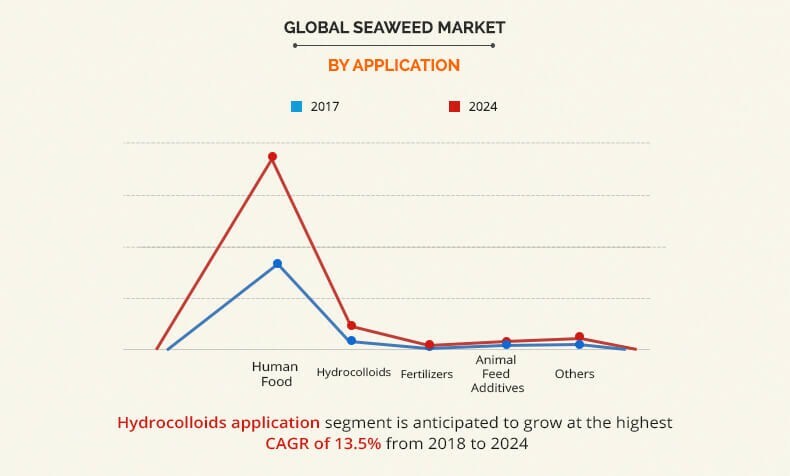 Increase in demand for seaweeds as human food and in the manufacture of hydrocolloids, such as agar, alginate, and carrageenan, are anticipated to boost the demand for seaweeds during the forecast period. Seaweeds find their application in fertilizers, animal feed, biofuels, and wastewater treatment, which further supplement the seaweed industry growth. The seaweed farming industry has developed in some countries of North America and Europe, unlike Asia-Pacific, where it is still in its nascent stage. In the recent years, the European policies have driven the development of seaweed cultivation as part of the European Union’s Blue Growth initiative. In support to this initiative, the countries across Europe are providing subsidies to study the possible applications of seaweeds across various end-use industries. Higher consumption of red seaweed in the food industry is anticipated to drive the seaweed market growth. 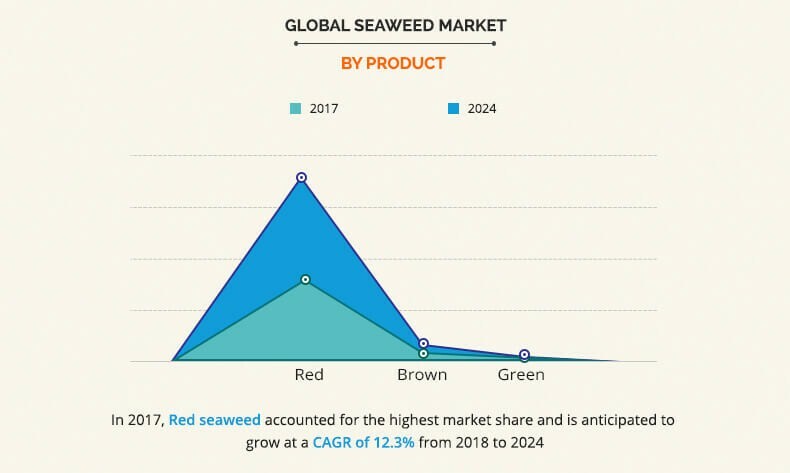 In addition to this, the human food application segment held the highest seaweed market share in 2017, as seaweeds are used in many maritime countries across the globe as a source of human food. The seaweed market is segmented based on product, application, and region. On the basis of product, the seaweed market is categorized into red, brown, and green seaweed. By application, the global seaweed market is classified into human food, hydrocolloids, fertilizers, animal feed additives, and others. Region wise, it is analyzed across North America, Europe, Asia-Pacific, and LAMEA. Some of the major players analyzed in the global seaweed market report are Cargill Inc., DuPont, Groupe Roullier, Irish Seaweeds, Qingdao Gather Great Ocean Algae Industry Group (GGOG), Annie Chun’s Inc., Chase Organics, GimMe Health Foods, Maine Coast Sea Vegetables, and Mara Seaweed. In 2017, Asia-Pacific accounted for the largest market share in the Global Seaweed Market, and is anticipated to maintain its dominance during the forecast period. A large percentage of the Asia-Pacific population lives along coastal areas, and thus is closely associated with the sea and its resources for food. Thus, the practice of farming seaweed originated in Asia-Pacific. China is the largest producer of seaweed in the world, accounting for approximately one-fourth share in the global market in terms of value. The pigments phycoerythrin and phycocyanin in seaweed result in red color, which masks the other pigments such as chlorophyll, beta-carotene, and a number of unique xanthophylls. In 2017, red seaweed held a dominant position in the global seaweed market, accounting for more than eight-ninths share, in terms of value. Organic beta-carotene obtained from green seaweed is useful in preventing some cancers, including lung cancer. Moreover, green seaweed finds several applications in the food industry. This is attributed to the fact that red seaweeds are the largest and most abundant of the seaweeds. Moreover, they have an economically important role throughout Asia-Pacific, due to the presence of phycocolloids such as carrageenan. The carrageenan produced from seaweed has a variety of applications in food production as a thickener and stabilizer. Thus, higher consumption of red seaweed in the food industry is anticipated to drive the growth of the market. Seaweeds are used in many maritime countries across the globe as a source of human food, hydrocolloids, fertilizers, animal feed additives, and others, which include aquaculture, biomass for fuel, and wastewater treatment. The human food application segment garnered the highest market share in 2017, as seaweeds are used in many maritime countries across the globe as a source of human food. In addition, the major utilization of these seaweeds as food and food ingredients is in Asia-Pacific, particularly in China, Indonesia, Philippines, Korea, and Japan where seaweed cultivation has developed into a huge industry. In most western countries, the usage of seaweed as human food and animal feed was restricted, and thus there was no major pressure to develop seaweed cultivation techniques. However, as citizens from Asia-Pacific countries migrated to other parts of the world, the demand for seaweed as food increased in different parts of the globe. This report provides a quantitative analysis of the current trends, estimations, and dynamics of the global seaweed market for the period of 2017&dash;2024 to identify the prevailing market opportunities. In-depth seaweed market analysis along with segmentation assists to determine the prevailing market opportunities. Seaweed, also called as marine macro-algae, is categorized on the basis of thallus color, namely red, brown, and green. Among all the seaweeds, red seaweeds are the largest and most abundant of the seaweeds, and thus hold a dominant position in the global seaweed market. Increase in health awareness and changes in lifestyles and taste preferences among consumer have boosted the demand for seaweed products. As inhabitants from Asia-Pacific countries have migrated to North American and European countries, the demand for seaweed as food has increased, thereby driving the market growth. For instance, Nori, commonly used by Japanese to wrap a sushi roll, are found in American grocery stores such as whole foods, which sell it as roasted seaweed snacks. Moreover, in North America, seaweed farmers have adopted various innovative techniques such as the vertical or 3D farming using the water column to grow seaweeds. In recent years, the European policies have pushed for the development of seaweed farming as part of the European Union’s Blue Growth initiative to explore seaweed application in various end-use industries. 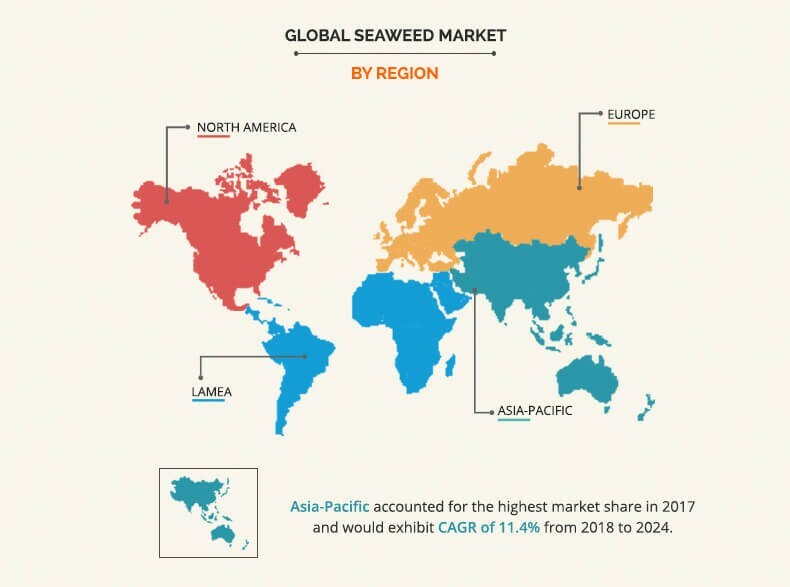 Thus, growing application of seaweed such as animal feed, fertilizer, biofuel, and wastewater treatment and untapped markets in North America and Europe are anticipated to open new opportunities for seaweed manufacturers. However, the volatility in the prices of seaweed and changes in weather patterns hamper the seaweed market growth.